How many headshots can one celebrity sign? It must be exhausting, jotting your chicken scratch across photo after photo of younger, handsomer you. Perhaps it’s a delight, then, to see a colorful, youthful drawing slide across your desk, even one that seems meant for someone else. Sure, Guy Fieri was probably confused when asked to sign a drawing of Shrek, and Alf creator Paul Fusco maybe wrinkled his brow at the sight of Al from Happy Days, but they signed them anyway. The drawings were clearly labored over by some sweet, well-meaning child, after all. Alas, they weren’t. Instead, they were sent by Cincinnati-based comedian Alex Leeds, who’s discovered an odd joy in getting celebrities of all stripes to sign strange drawings that only tangentially relate to their careers. 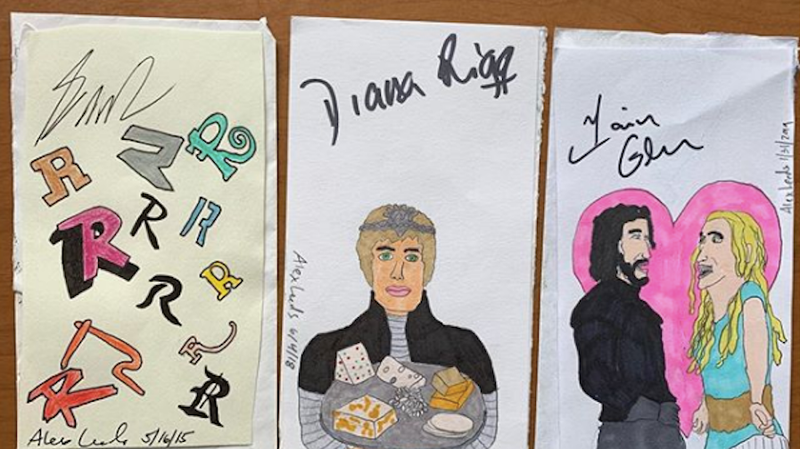 You can view the fruits of his labor on the very, very funny Dumb Celeb Drawings Instagram, which finds everyone from Gary Busey to Jimmy Hoffa Jr. to former Secretary of State Madeline Albright scrawling their names across sketches that could come only from a child or a madman. There’s no shortage of good bits here—we can’t stop laughing at Frances Ford Coppola signing a drawing of WWE’s The Godfather, or Iain “Jorah Mormont” Glen scribbling over Jon Snow and Daenerys Targaryen falling in love—but the standout has to be the shocking amount of politicians Leeds has heard back from. Lindsey Graham signed a drawing of Teddy Grahams, Bob Dole signed a can of pineapple juice, and Newt Gingrich signed a photo of a Fig Newton. What the hell. Leeds says his weirdest get, though, was Jeb Bush, who acknowledged his “please clap” gaffe by signing a drawing of the handclap emoji. “Funny,” he added. Jeb’s father, George H.W. Bush, was less keen on signing a “Mission Accomplished” banner last year. President Jimmy Carter, too, refused to sign a drawing of his Vice President, Walter Mondale. Take that how you will. Lest this post just regurgitate every amazing drawing, we’ll now direct you to the official account here, where you can see the joy that is a Dr. Ruth-signed drawing of Dr. Phil.